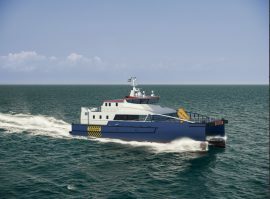 Seacat Services has installed Reygar’s BareFLEET monitoring system across its entire fleet of offshore energy support vessels. 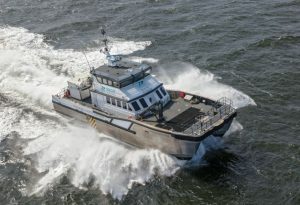 Damen Shipyards Group has designed a new Fast Crew Supplier (FCS) 3410 service accommodation and transfer vessel (SATV) with features that are said to ensure its suitability for operations in the developing offshore wind market in North America. 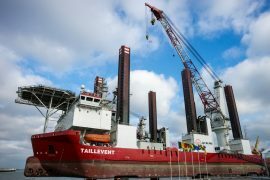 Jan De Nul has officially named its newest offshore installation vessel, Taillevent, in the Belgian port of Ostend. 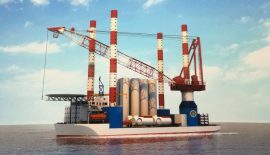 Huisman Equipment has signed a contract with Japan Marine United Shipyard (JMU) for the delivery of a 1,000mt SWL Pedestal Mounted Crane for an offshore wind turbine installation in Japan. 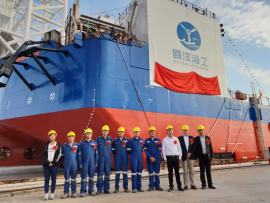 China’s Ouyang Offshore has launched its wind turbine installation vessel, OuYang 1, at Dayang Offshore Equipment’s yard in Jiangsu, China. 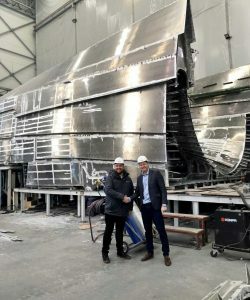 The construction of Acta Marine’s third walk-to-work vessel and second Ulstein SX195 design is progressing well and has reached complete hull beam at Crist shipyard in Poland, the Dutch company said. 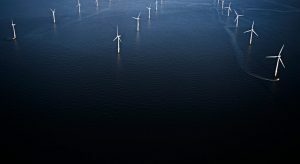 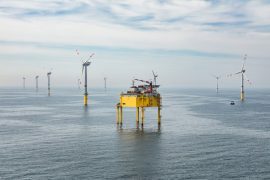 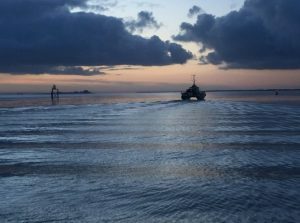 Global Tech I Offshore Wind GmbH and Ocean Breeze Energy GmbH have issued a tender for the provision of supply vessels for the Global Tech I and BARD Offshore 1 wind farms in the German North Sea. 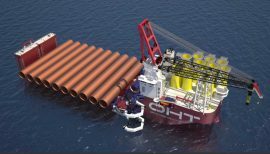 Norway’s OHT has signed a contract with China Merchants Heavy Industry (CMHI) in Jiangsu, China, for the construction of a 48,000 dwt semi-submersible offshore wind farm foundation installation vessel, with options to extend the program with up to three vessels. 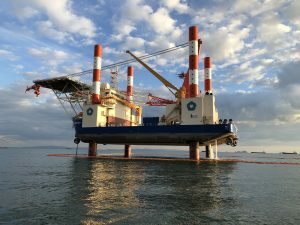 The walk-to-work vessel Stril Server, together with the crew transfer vessel Marieco Mariah, is currently working on cable commissioning works on wind turbine foundations at the Beatrice project site, in preparation for the installation of wind turbines. 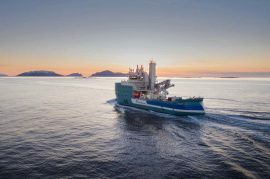 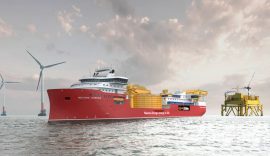 Nexans Subsea Operations and Ulstein Verft have signed a contract for the construction of a large, DP3 cable laying vessel, to be named Nexans Aurora and delivered in 2021. 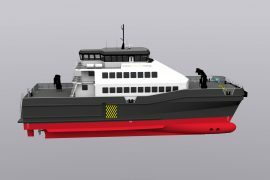 Manor Renewable Energy has completed the design phase and tank testing of a new 40-metre technician support vessel that the company plans to have built in 2019. 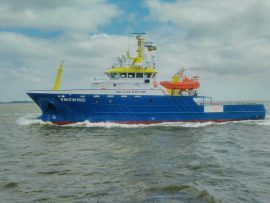 EMS Maritime Offshore GmbH (EMO) and Van Laar Maritime BV have christened the new offshore wind multi-purpose and support vessel EMSWIND. 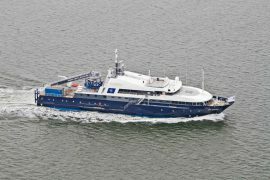 Acta Marine has officially named its new walk-to-work (W2W) vessel Acta Auriga at a ceremony held in Emden, Germany. 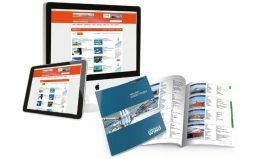 The new and updated edition of the Offshore WIND Vessel Directory will be launched at Seawork International in July: the Offshore WIND Vessel Directory 2018. 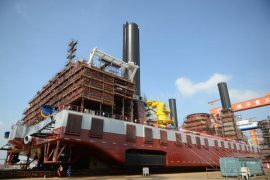 Shanghai Zhenhua Heavy Industries (ZPMC) has delivered the Longyuan Zhenhua 3 jack-up vessel to Jiangsu Longyuan Zhenhua Marine Engineering, a 50-50 joint venture between ZPMC and Jiangsu Longyuan Offshore Wind Power that will use the vessel for the installation of wind turbine components off China’s coast. 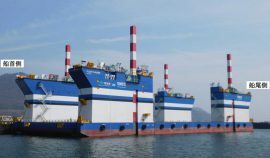 Japan’s Toda Corporation has, in collaboration with Yoshida Co., Ltd., launched a vessel designed for the installation of floating offshore wind turbines. 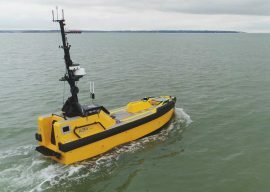 A new joint industry project led by ASV Global is set to explore the technical, regulatory and societal issues of using autonomous surface vessels, integrated with existing manned shipping operations, to support offshore wind farm operations and maintenance. 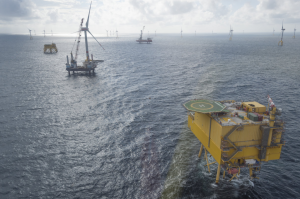 The Offshore WIND team is currently preparing the 2018 version of the Offshore WIND Vessel Directory, the reference book for purpose built offshore wind vessels. 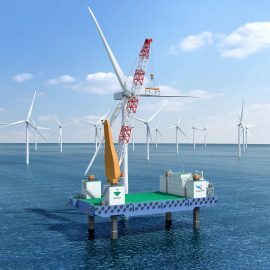 Jiangsu Longyuan Zhenhua Marine Engineering has ordered an offshore wind installation platform with a lifting capacity of 2,500 tonnes from ZPMC.